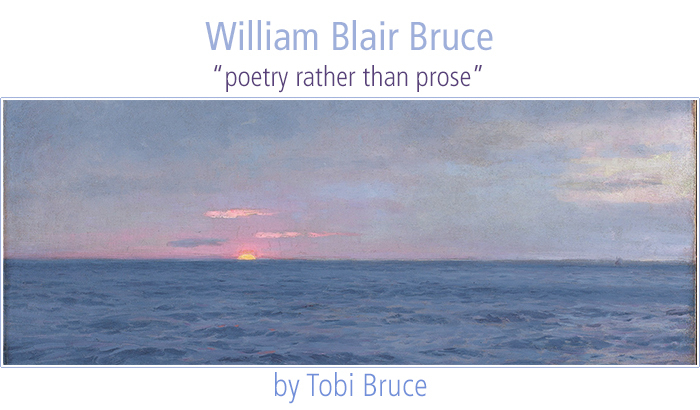 In William Blair Bruce’s first letter home to Hamilton, penned July 10, 1881 from Paris, the confident young painter acknowledged that Turner “could paint some,” [yet] he is all but “disappointed” at that year’s Royal Academy exhibition.1 “After going the rounds of the Royal Academy,” he writes, “I felt that I was a painter, not of things but the feeling of things, the spiritual more than the earthly, poetry rather than prose [italics mine].”2 He then set a challenge for himself. I want to make a disclosure. What I am going to say is not braggadocio but what I have arrived at by close study of landscape artists Ancient and Modern of almost every country … Salvator Rosa, Claude Lorrain, Nicholas and Gaspar Poussin, Turner, Zeim [sic], Diaz, Rousseau, Troyon, Corot, Constable, Cox, a host of Associates of the Royal Academy and of the French Salon Americans, etc. I have underlined the poets. This conclusion I have arrived at (please don’t laugh, for I mean it): that in one year from the date of this letter I will (God permitting the health and money) paint pictures that will have more poetic feeling in a square inch than the other painters have in a square yard . . . at the end of that year I will throw down the gauntlet to every landscape painter who inhabits this precious globe. 1 William Blair Bruce to his mother and grandmother, 10 July 1881, in Joan Murray, ed., Letters Home 1859–1906: The Letters of William Blair Bruce (Moonbeam: Penumbra Press, 1982), 35. 2 Bruce to his mother and grandmother, 10 July 1881, in Murray, Letters Home, 35–36.